Diary of a Pro-life Girl: Opposing View of the Week: From Naked at UBC: Why the hell did that woman take her clothes off on campus?! Opposing View of the Week: From Naked at UBC: Why the hell did that woman take her clothes off on campus?! I've been wanting to comment on this for a really long time. Basically, the Genocide Awareness Project, which compares abortion with other atrocities such as the Holocaust, was holding a demonstration at the University of British Columbia, and rather than protest the old-fashioned way, Justine (the young woman who wrote the blog post) decided to take off all of her clothes. Back in March, an acquaintance of mine, who goes to UBC, posted Justine's blog on her Facebook, so I clicked on the link because it said "naked" (I know, so mature!!). When I saw what the nakedness was about, my immediate thought was "wow! the pro-life world is going to be all over this, if this is the best protest pro-choicers can come up with". Alas, the pro-life blogosphere largely ignored Justine (perhaps because her protest was just so juvenile?). Her blog, however, is very articulate, and so I will attempt to address her points here. (Aside: you can listen to CCBR's thoughts on her display here). "I hope [this post] will prompt people to think about free speech, our right to protest against things we find abhorrent, and what role the university plays in restricting or allowing protest." "So I took off all my clothes and sat in front of the display until it was taken down..."
"As someone who supports women’s universal access to free, safe abortions, I fundamentally disagree with the anti-abortionists’ message. That said, I respect their right to hold their opinion as long as they don’t infringe on anyone’s right to access a free, safe abortion." I always find statements like this interesting. She respects the pro-lifers right to their opinion, but only as long as their opinion does not "infringe on anyone's right to access a free, safe abortion". Since the pro-life goal is, broadly speaking, to have abortion re-criminalized, infringing access to abortion is exactly what pro-lifers are trying to do. 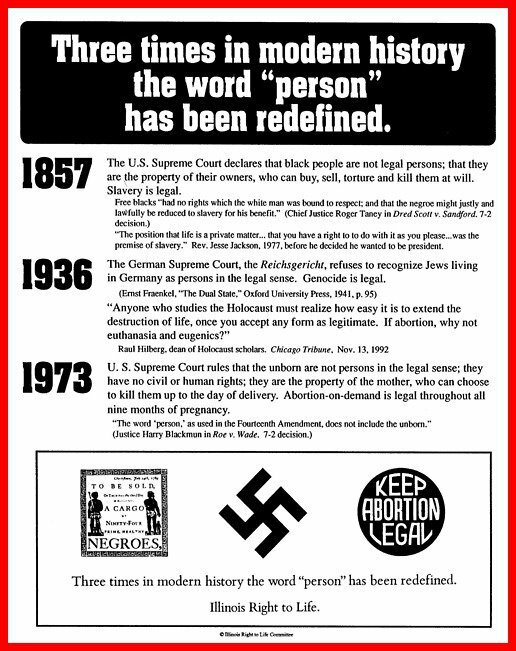 Perhaps not specifically with the GAP display, but the comparison of abortion with other legal atrocities like the Holocaust, does imply that abortion should be made illegal. Clearly, she does not truly respect the pro-lifers "right to hold their opinion", since their opinion drives them to try accomplish exactly what she doesn't want them to do. (Quick explanation for my American readers: abortion is paid for by our taxes in Canada, which is why Justine says "free, safe abortion"). Now moving onto the meat of the post. Her main points, as I see them, are addressed below. "They are saying that a woman who chooses to terminate her pregnancy is akin to Nazis, terrorists, Klu Klux Klan members and the Santebal [...] The implication is [also] that anyone who supports a woman’s right to choose is also participating in mass, organized murder ..."
She at least gets part of the message. The implication that pro-choicers themselves are actively supporting and participating in the systematic destruction of real human persons is uncomfortable to say the least. But that is what is happening. You won't find a single post-abortive, ex-pro-choicer who denies that. A recent article by Abby Johnson, who herself had two abortions and was a Planned Parenthood employee, is a wonderful example of the growth, love, and healing that the pro-life community strives to extend to those Justine claims we condemn as evil. Additionally, many women are tricked, coerced, or pressured into choosing abortion, at which point they also become victims. "'[My] first thought was: "I wish I were Jewish, or Lakota, or Cambodian so I could tell those people how deeply disrespectful and ignorant their posters are.' Imagine that! My first thought was that I, as a woman, did not have a legitimate grievance against images which equate my right to choose with enthusiastic membership of the Nazi party." I find this quite refreshing actually. Normally, I am confronted with pro-choice activists who claim that lack of access to abortion confers onto them the title of Most Oppressed People Ever. It is nice to see a pro-choicer realize that the lack of abortion access is NOT the same thing as having your life violently taken from you. Now if only she could extend these same thoughts to the unborn, whose lives are also being stolen from them in the most atrocious of ways. "Many of the people I spoke to said they wished they could knock over the signs or unplug the PA system [... they] also said they were afraid of getting [in] trouble and remained where they were. [...] I was deeply troubled by the fact that people were so afraid of … what? Getting kicked out of university? Being stripped of their scholarships? There seemed to be a feeling that stepping outside of the zone reserved for protest would have disastrous results, and no one seemed willing to test the rules." This is most telling. She began her blog post by talking about nice things like "free speech", "right to protest", and "respecting opinions"; and yet implies (if not fully admits) that she wishes that she and her fellow counter-protesters could shut down and suppress the pro-lifer's message without repercussion. I am glad no one actually knocked down signs or unplugged the PA, but I am deeply troubled that the reason this did not happen is because they were afraid of the consequences. What about respectful, peaceful dialog? What about encouraging discussions between opposing views? What about, to use Justine's words, the right to free speech and the "right to protest against things we find abhorrent?" No matter what side of the debate you are on, if you feel you have to silence your opponents through vandalism and interference, then (in my opinion) you immediately sacrifice your credibility, otherwise why wouldn't you be in favor of open, respectful dialog? Additionally, freedom of speech and expression is supposed to be a fundamental freedom in Canada, and I would hope that most Canadians want this freedom to be respected.
" I am an exceptionally privileged person." I agree. For one thing, you are alive - unlike the victims of abortion. And you live somewhere where you can exercise life-or-death decisions over someone else and not get arrested for doing so. "My freedom to exercise control over my own body without shame or fear is a freedom I want all people to have because only when all people are free from oppression and shame will we live in a universally peaceful and egalitarian society." That's interesting, considering the unborn are not even considered persons under Canadian law, and those who are aborted will never be able to exercise control over their own bodies. Does that sound equal to you, dear reader? Let me fix her statement: "My freedom to exercise control over my own body [by killing my children should they reside in my womb] without shame or fear is a freedom I want all [born] people to have because only when all people are free from oppression and shame [but are not free from being dismembered, disemboweled, starved, burned, and/or poisoned if they happen to be less than approximately than 9 months old] will we live in a universally peaceful and egalitarian society [excepting those who are pre-born, who do not have any rights whatsoever]". "[As] I take my freedom for granted I make it more difficult for someone else to achieve freedom." Someone, perhaps, like a full term baby that is torn apart limb from limb? And before anyone claims that we don't need laws against late-term abortions in Canada because they just don't happen, they do. Apparently only when it does not extend to everyone in our human family. "My body is where I exercise and appreciate my freedom on a daily basis, and I reject outright the assertion that by supporting the right to free, safe abortions, I am turning it into a tool of mass murder." Except by supporting abortion on demand, for any reason, Justine is supporting the abortion (i.e. : killing) of the unborn. She might not think that killing unborn babies is a bad thing, but she should be honest with herself: she is supporting the mass destruction of unborn babies' lives. (Aside: I am wondering why she did not simply walk up to the GAP protesters and speak her mind - the whole point of GAP, as quoted from their website, is to "engage passersby[s] in discussion[s] about abortion", so the opportunity was definitely there. I've also listened of recordings of different GAP demonstrations, and the people running GAP spend much of their time listening to and addressing the public's responses to their display. Odd that she seems to think freedom of speech is such a great thing, but didn't even bother to exercise it by directly confronting the GAP activists). "It didn’t take long for campus security to arrive and ask me to 'cover up.' I asked why, and was told that I was 'indecent.' I found this particularly ironic, seeing as I was sitting in front of a six-foot-high image of naked bodies piled in a mass grave"
There is a huge difference between choosing to strip down in public vs. being murdered and then stripped naked by the people who killed you. I'm ashamed for her for making this statement. "And this is the kicker – the university has translated the campus security guard’s allegation that I 'disrobed in the plaza…' into an allegation that I disrupted the GAP display. In other words, UBC is laying charges on behalf of a 'victim' who never even made a complaint. I expected that there would be repercussions to my actions that day, but I never suspected the university would come to the defence of a highly controversial anti-abortion group WHICH DIDN’T EVEN ASK TO BE DEFENDED"
I am totally in support of Justine on this. UBC did not handle the issue properly at all. By all means, take issue with the fact that she was sitting outside naked on school grounds, but she was clearly very careful to not disrupt GAP in any significant way. "The university can expel you for plagiarism, but they can’t kick you out for expressing your opinion – in fact, that’s what we’re supposed to be learning how to do. Do not be afraid to speak up when you see something that offends your humanity. Don’t let the threat of campus security or the police stop you from speaking truth to power, or the fear of breaking with social norms stop you from standing up for what you believe in." My point? Freedom of expression has to go both ways, and the issues in Canada (both at Canadian Universities and in the public) with regards to our freedom of speech are pretty serious, especially if you are pro-life. When a peaceful, old grandmother spends years in jail for having an opinion in the wrong location, then there is a problem with free speech that goes beyond anything that happened to Justine. I am extremely glad that the injustice of UBC's actions against Justine were brought to light, but I would like to see worse transgressions equally condemned and dealt with in a similarly quick and fair manner. It took about a week for UBC to drop the allegations against Justine - it took over a year for Carleton University to drop trespassing charges against Carleton Lifeline members, who were arrested for trespassing onto University grounds ... and three of them were members of that university. 1. That in supporting abortion rights, she does support the destruction of human lives. She might not find those lives valuable or worthy of protection, but she supports their destruction nonetheless, and so statements like "I reject outright the assertion that by supporting the right to free, safe abortions, I am turning it into a tool of mass murder" demonstrate how much she has missed the point. 2. Freedom of speech should extend to abortion activists and anti-abortion activists in equal measure. Justine and her fellow protesters are not brave or noble for expressing a desire to sabotage the GAP display, and being afraid to do so does not mean that they are being oppressed in some way. 3. The attacks on pro-life demonstrators for expressing their opinions have been far more serious than those that were leveled against a girl who stripped naked and then lied to a security officer. It is awesome that the university dropped the allegations against her, but people everywhere should be equally prepared to defend pro-lifers in similar situations, especially if they claim to value freedom of speech and expression.